This image of the source print is taken from an engraving published, or possibly just re-published, in 1753 as part of a group of twenty engravings, by publisher Robert Sayer. The caption under the engraving reads The Figure of Heaven is all Delightful--A View of the Temple serv'd by Eunuchs, & of the delicious Round Island it stands upon. The actual location of the island has not been determined. The artist and size of the original engraving are unknown. 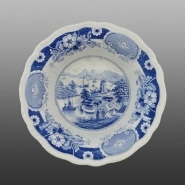 Shown here is the large earthenware wash basin with a molded gadroon border printed in the same pattern. The basin is 14.5 inches in diameter and 5 inches high. Seen here is a side view of the large wash basin printed in a border of large floral and geometric shapes. India Temple was a popular pattern and was also printed on Ridgway's toilet sets. 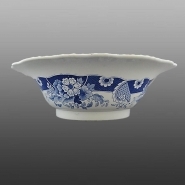 Shown here is a large earthenware wash jug and basin printed in blue with a molded gadroon border. The jug's handle is elegantly molded and the pedestal of the jug is molded in a simple linear pattern.